I started my college career knowing one thing, I would not become a teacher. I vividly remember standing in line at college orientation, it was that pivotal moment where you choose your major and without having any real plan… only the list of things I didn’t want to do spinning in my head, I looked over at the teacher line almost in defiance. It was a common thing to do in our town, become a teacher. But me, I would become an event planner… or a Public Relations Associate (whatever that means… though that is what my degree is in.) Or I would become a full time photographer, a dream not yet realized. There I was standing in the undeclared line, I had two years to decide, and I bunch of generals to take anyways. A degree in Communications ended up being the route I took. Honestly it just made sense to go in that direction, it was the thing that came naturally to me and Public Relations just seemed logical. Learn from the experience of 9 different creative professionals. Grab your FREE E-Book and embrace your dream this year! You did it! Download your FREE E-BOOK HERE and start living your dream today! I was on my way to earning a college degree, because well… that’s what you were supposed to do when I graduated high school. And I loved all my communication classes. I actually loved everything about them. I learned magazine layout while working on my college’s magazine, I spent time in our radio booth, I studied how different website’s communicate to their audience, and I took my first photography class. That photography class was my hook. That photography class inspired me to chase a dream. I spent my last year of college taking pictures of anyone that would step in front of my camera. I did my first photo sessions on film. I assisted at my first wedding. Not very long after that I moved back home and before diving in to a master’s degree I decided I would test the waters. I wasn’t wiling to sink anymore money into student loans without knowing if being a teacher was what I really wanted. So, I found a job as a paraprofessional (or teacher’s aid, or class room aid, whatever you want to call it.) I spent a little over a year working in a class room. Seeing all the ins-and-outs, the students, the teachers, the politics and a found out what I needed to know. I did not want to be a teacher. Next thing you know I’m married, living in California and still unsure of what I want to be when I grow up. So I did what anyone would do, I found a job. For clarity and to make this long story not so long, I quit that job after 8 months. It wasn’t a good fit and I was dealing with anxiety (something I had never experienced before), so I decided to do something different. I didn’t know anyone and driving in LA wasn’t for me, so I knew I didn’t want to pursue portrait photography. Who would I take pictures of? And I would probably have an anxiety attach just driving to locations anyways. I had seen a few people selling handmade items on Etsy, so I decided I would give that a try. I handmade zip pouches and wallets. I was half way good at it, but overtime I learned that wasn’t for me either. Time to try something else… I moved on the creating digital goods; calendars, worksheets… I wasn’t very good at that. At about that time we were moving again… that’s what we do… we move. But this move was a little different. Tyler had accepted a contract position for the next 5 months. We didn’t know what would be happening at the end of those 5 months, so I was kind of in limbo. I was out ideas for what to sell on Etsy. I was blogging, but without any real niche. After 5 months Tyler was offered a full time job, it was time to find a place to live and I decided it was time to find a job. PRACTICAL STEPS FROM 9 different creative professionals. Grab your FREE E-Book and embrace your dream this year! I hadn’t given up on any of my dreams… I had always dreamed of having a small business, but we had student loans to payoff. I needed consistent income so we could plow through the mountains of student debt we had. (If you’re reading this, do not take out student loans. There are so many others ways to do it.) So I went to work and started to dream again about what kind of business I would pursue. I tried to blog consistently, it was fun and it kept me moving forward trying different things. For a hot second I considered portrait photography again, but I just didn’t feel that was my strength. Because I was blogging consistently I was getting half way good at product photographing and that’s when it hit me. I would be a product and stock photographer. I took my first client in 2016 and I slowly started to grow a little business. In 2017 I launched a new shop full of stock images and in 2018 I launched my stock photo library. I was reading book after book trying to learn about business, I was listening to podcasts, I was watching webinars, I was trying to do what everyone successful was doing. I was producing new photos every month. I was trying new things creativity, pushing myself to succeed. If the business was going to work it had to be profitable. It had to match my current income. I had to keep going. But, the business wasn’t profitable. Now, I’m going to lay it all out there… and I’ve buried the lead, so get ready. I’m closing the shop and the member library (if you’ve made it this far, bravo!) To be honest, I could keep going with it, I could keep trying, because I believe the business could be profitable, but I’ve come to a place of burn-out and I’ve come to a place where I’m not in love with it… It’s not fun. And if I keep going, there is a far greater chance that I’ll really resent it. I also plan to retire the Elah Tree brand. I’m not giving up, I’m not throwing in the towel… it’s just time to take a break and it’s time to dream a new dream. It’s time to start fresh. It’s time to rebrand. So, why did I tell you all of that before telling you about this E-Book? Because I wanted you know that it’s truly never too early or late for your dream. It’s never too late to change direction. It’s never too early to get started. It’s completely okay to try different things and not have things workout. It’s okay to to start one thing, figure out it’s not for you, and try something else. I’ve tried so many different things and changed directions so many times, but I’m always willing to keep going. I’m always ready to embrace a new dream. I’ve come together with 8 other amazing women and we’re all sharing our journeys with you. Practical steps to help you get started and things that really made a difference for each of us. We’re here to inspire and lift you up, so grab your copy and embrace your journey this year! One of the biggest struggles I faced when I first began my photography journey was wondering whether or not the gear I was using was good enough. I wondered what the pros were using? How were they creating such magical pictures? ... And how could I do the same? One thing I want to encourage you in is believing in yourself and not in your gear. Your gear is simply the tools you use to create your images, but with practice, a little ingenuity, and trusting yourself, you can make magical photos. Today I'm sharing my favorite gear for product photography and I'm also going to share a few tips and tricks for alternatives. Nikon D700 : The Nikon D700 has been retired, but here is it's counterpart. The Nikon D700 is ideal for me when shooting products because it's full frame, allowing me to get more into frame. I often pair the D700 with the 50mm. If you're shooting with a crop sensor camera body and you're struggling to get everything in frame, the 35mm would be great to pair with it. Nikon D300s : The Nikon D300s is also retired, but we love this camera because it has video. We don't do a lot of video right now, but it’s one of our favorite camera’s to use on the go. I pair the 35mm with the Nikon D300s because it allows us to get a lot in frame. Alternatives : Nearly all the DSLR's that are released these days are phenomenal. Learn your camera, read your camera manual and really learn lighting, and you'll be making magical photos in no time. Nikkor 35mm : As I mentioned above, I often pair the 35mm with the Nikon D300s. This is a solid shooting lens with a 1.8 aperture, great taking product photos with beautiful blurry backdrops. Nikkor 50mm : The 50mm is what I pair with the Nikon D700. For my personal preferences I don't like to pair anything under the 50mm with the D700 because it's a bit to wide. If you were shooting something like landscapes or cityscapes, wide angle lenses are ideal, but I think the 50mm is perfect for products and lifestyle. Alternatives: In photography, lenses really do make all the difference. I would recommend investing in your lenses before you do anything else. The 50mm and the 35mm are both great jumping off points. If you are shooting with the stock lens that came with your camera don't be discouraged. I would encourage you to (1) practice shooting outside where you don't have to fight the light. Fighting light is often the biggest struggle. (2) Learn what your lens and camera are capable of by shooting at different apertures. Softboxes : I haven't always shot with softboxes, but I do really love them because they are incredibly convenient. Softboxes aren't necessary when shooting products or lifestle, but they are helpful when trying to fill out the light in a room. I prefer to shoot with natural light, but if your light is uneven then softboxes really help. Alternatives: Amazon has a variety of softboxes to choose from ranging in price. If your industrious and enjoy DIYs you can find a variety of DIY softboxes online too. Manfrotto Tripod : This tripod is not specific to Flatlay, as an ideal Flatlay tripod would have a horizontal harm like this one. But this particular tripod has been working great for me, so I love it. I have had this tripod for years and since it is working for me, I have never felt the need to get something different. This one works well because it has a ball head which allows me to turn the camera face down. Light Reflector Set : My light reflector is maybe one of my favorite and most used photography accessory. I have used it in different situations to reflect light, but I also use it to diffuse light. Diffusing light is what I use it for most these days, as I need soft even light. Alternatives: There are a variety of items that you can use as an alternative to diffuse and reflect light. White foam core boards are perfect for reflecting light and if you need to diffuse and soften light a white sheet does the job. Email lists are one of the most popular topics in which I get questions about. And for good reason, building an email list and creating a healthy system to manage that list is one of the best things you can do for your business. Don't just take my word for it. Think about some of your favorite brands; Gap, United by Blue, Magnolia, Letterfolk, West Elm, Anthropology. They work hard to build their email lists and they want you on their list too. They ask for your email almost every time you go through the register. Anytime you stop by their website they give you an opportunity to sign up too. And they do a great job at it. In trade for your email, they offer 10% off your first order or they offer you free shipping. If you give them your birth date they'll even offer you something special on your birthday, like a free drink. An email list is a direct link between you and your customers. Between you and your audience. Whether you are a small business, a lifestyle blogger, or a service provider, you can grow your brand and create a lasting connection with your email list. Every time a brand shows up in your inbox, even if you don't open it, you are reminded of them. I get plenty of emails from West Elm and Anthropology that I don't open, but I never unsubscribe, because one-day they might send me the exact deal that I need. They know it and I know it. I know, the idea of emails and list building may be overwhelming, but they don't have to be. List building is all about creating a system and this type of system can be created in steps. And these steps can be built over time. Try not to get ahead of yourself. It's easy to get excited and want to do everything all at once. But if you do the work ahead of time and set up your system first, you will be in amazing shape, your list will be growing, you'll be connecting with your audience, and your system will be doing the work for you. You did it! Download your list building blueprint here and start growing your list! Plus, as a new subscriber, you get access to FREE stock photos! Make sure to check your email and confirm your subscription! Choose a provider to manage and build your list. There are plenty to choose from; MailChimp, Convertkit, Mad Mimi, Infusionsoft, and many more. When making your decision choose the one that is best for you and your current situation. I use MailChimp, which has been perfect for me and I can't recommend it enough, especially if you are just starting out. You can sign up for free and your account remains free up to 2,000 subscribers. I've also heard good things about Convertkit and I've heard a lot of businesses switch over once their managing multiple lists and revenue streams. This is super easy. If your using MailChimp this is as easy as a few clicks. You'll name your list, set up your email, etc. MailChimp is extremely user-friendly and if you run into anything you're not sure about they almost always have an example or guide to get you through it. Create a welcome sequence or onboarding system. In MailChimp, this is an automated sequence of emails welcoming new subscribers. This is going to take the most legwork, but it's also going to do all of the work for you. A welcome sequence can be a single email to a sequence of emails. The first welcome email often introduces you to your audience and also includes the download/freebie that they signed up for. If you want to create a sequence of emails, which I highly recommend, you'll want to set up a sequence of nurturing emails, followed by an offer email. Nurturing emails are meant to serve your audience, before selling anything to them. Let's use my on-boarding sequence as an example. I have 6 emails in my welcome sequence. The first 3 emails are all nurturing and the final 3 include an offer. My first welcome email introduces me to my new subscriber, includes a link to their free downloads and talks a little bit about the benefit of using styled stock photos. The second email is what I would consider a resource email. It outlines a variety of resources they can utilize on our website to help them do business better. The third email includes a link to a special download and includes a survey (which helps me serve them better.) My forth email includes a special offer only available to subscribers. My fifth email answers any questions they may have about the offer. And the sixth email lets them know that their offer is about to expire. I'm going to be honest, it took me a long time to create my system and I continue to tweak it as I continue to learn. Your welcome sequence does not have to be as long as mine. You can start small, with a single email and add to it as you go. The important thing is to really think about how you will serve and communicate with your subscribers. They're on your list because you have something they need or want. If they unsubscribe, that's no reflection on you. That simply means your not a good fit for each other. They may come back later and that's cool. Don't sweat the unsubscribes, focus on those who really want what you have to offer. This step of setting up your welcome sequence does take a significant amount of work, but this is the part that will keep working for you as your list grows. Once you set up your welcome sequence, these emails will be taking care of your subscribers 24/7. You might be thinking, "how am I supposed to make an email sequence about my freebie when I haven't even made one yet?" We're almost there, trust me. And I get it, it might seem odd to set up a welcome sequence without having created your freebie yet. But your welcome sequence sets the tone for your relationship, so while your freebie hooks new subscribers, your welcome sequence is more important. Creating your welcome sequence first forces you to think about how you plan to communicate with your subscribers and how you'll bridge the gap between your subscribers and your product. While you work through this step you'll be brainstorming the perfect freebie to bridge that gap. Create your emails and remember to go back to update them with the freebies you create. I think one of the most overwhelming things about having an email list is figuring out how to serve them. Especially when you're just getting started. So the next step in your list building blueprint is to outline your content calendar to serve your subscribers. Outlining your content will give you confidence once your email list starts to grow and you'll be all set to serve them right off the bat. Now, let's brainstorm some content that you can serve up to your subscribers. Once you've brainstormed your content add it to a calendar. I use Google calendar for all my content and once a month I review upcoming content to make any changes. Because my content is outlined I'm never scrambling or feel rushed to wing-it. Do the work, plan ahead, and you'll be in great shape. Okay, friend, this is where you create the freebie or download to hook new subscribers. We've already done a lot of work before even getting to this part. But that's okay, because the magic is in the prep work. The most important thing to remember when creating your freebie or download is to make sure it aligns your audience with your product or offering. You don't want to offer a freebie that doesn't connect your subscribers to your product. Otherwise, neither them or you will be a good fit. You want to do the work of creating something that is a perfect fit, that way your subscribers will be head-over-heels for your offer. Let's work through some examples. One of the main freebies I offer is FREE styled stock photos, which is perfectly in-line with my product and customer needs. It gives customers an opportunity to test out the styled stock images and also gives me an opportunity to share how stock images can really make a difference in their business. Let's say you sell a physical product, you could offer a discount on their first purchase or free shipping. You could even create a downloadable freebie that pairs with your products. Remember when Magnolia offered free decorative prints, which were perfectly aligned with their design style. I didn't think twice about downloading them. Another example, I create a variety of downloads specific to business, like this Instagram calendar (which could be used with styled stock photos), or this Instagram Toolkit. Because I know my target audience is also feeling overwhelmed I created freebies to help with that exact thing, like this maintenance day checklist. This step might be easy to overthink, but just think about some of your favorite brands and think about what freebies they are offering. If your selling physical products think about what larger brands are doing, like Anthropologie and West Elm. At the top of the Anthropologie website, you can sign up for free shipping. At West Elm, you can save 15% off your entire order. Do you offer digital products? Is there anything that you can create to offer for free? Can you create an e-course? You can do this! Need FREE stock photos to help promoate and grow your email list? Sign up and receive 15 FREE stock photos today. You did it! Your FREE photos are headed to your inbox, make sure to confirm your subscription! Plus, you're now set to receive FREE stock photos every month! I'm rooting for ya! Now that you've created your freebie, a freebie that aligns perfectly with your customer, it's time to create a way to offer that freebie and collect emails. You can do this a few different ways, but in short, you want to create an opt-in. Most websites have opt-ins in multiple places, giving new visitors plenty of ways to subscribe to your list. There are lots of different ways to add opt-ins to your site and Squarespace makes it so easy. You can use their announcement bar feature to direct subscribers to an opt-in page. You can use the promotion pop-up to offer your freebie and collect emails. You can create a blog post promoting your freebie and collect emails through an embedded form. You can create a separate opt-in page, like this too. If you're not sure how to create an opt-in page, check out this how-to. You can add forms at the bottom of each blog post (scroll down and you'll see mine.) You can also add opt-in forms to your blog sidebar. There are multiple ways to collect emails, the great thing about that, is you can utilize almost all of them. Creating your opt-in forms can be even easier with stock photos too. You can use stock photos to create an opt-in page. And you can use stock photos to customize any promotional pop-ups you create. We're on to the fun part, woot! We're about to the cross the finish line! It's time to throw some confetti for all the work you've done! You've determined how to manage your list, you've set up your list to collect emails, you've created a welcome email sequence, you've outlined your content calendar, you've created your freebie, you've added all your opt-in forms, now it's time to promote your freebie! The easiest ways to promote your freebie is through a blog post and you can use Pinterest, Instagram (plus Instagram stories,) and Facebook to funnel people to that blog post. Did that just sound like a lot? With a little bit of planning, it doesn't have to be a lot. You can create images and posts that all work together. Your focus during this promotion is to use all the platforms I mentioned to funnel new visitors to your opt-in forms. You definitely don't want to have done all that work to set up your list and then not be able to promote it well. 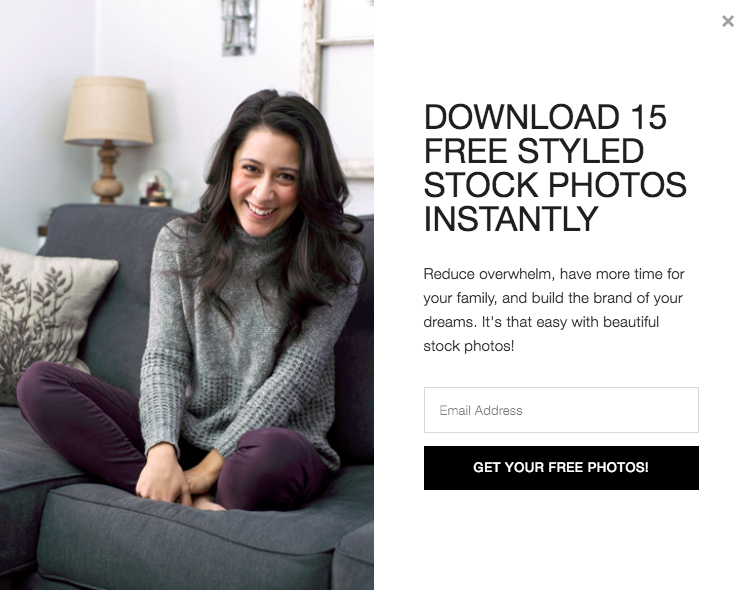 Want 15 FREE stock photos straight to your inbox? Plus, fresh new photos every month? Become an Elah Tree Insider! SIGN UP BELOW! When I finally decided to serve and grow my email list instead of trying to frantically grow my Instagram, things in business got easier. It's not that growing an email list doesn't take work, it does. But the amazing thing about growing your email list is that it is not dictated by changing algorithms of another platform. You don't run the risk of your audience not seeing your posts, you don't run the risk of losing out on potential new customers. When you grow your email list you're letting people know, "hey I want to serve you. I want to help you to thrive in your business and in life." Instagram, Facebook, and Pinterest are all great social platforms, and I believe the best way to use them for your business is as a funnel for your business. So how do we do that? We create an opt-in page that lets your potential clients and customers know that your goal is to serve them. And getting on your email list means that you'll be serving up lots of great content and deals that help them. Ready to create your opt-in page? Let's do this! Create a freebie or download that will serve your audience. It's one thing to ask someone to join your email list just for the heck of it. It's a whole other thing when you serve them first. So, as you begin the planning stages of creating your opt-in page think of a few ways that you can serve your audience first. Here are a few ideas to get your juices flowing. Once you have a freebie that is going to serve your audience then you can say, "hey, sign up for my email list and download your FREE list of business resources." Providing a FREE item for your audience lets them know you're ready to serve them. 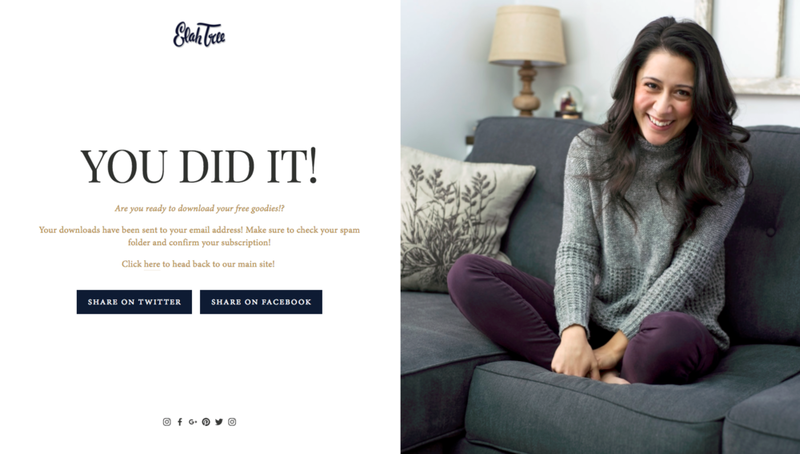 Squarespace makes it crazy easy to create an opt-in page. It's actually been one of the easiest pages for me to create. To get started you want to create a new page that is not linked. Once you click the little plus sign to create a new page, select Cover Page. You can check out my Opt-in page here, I used the cover page layout "card." I'm partial to this layout as it's very clean, simple and allows me to include all the important components. The next thing you want to do is customize the text for your opt-in page. Most cover pages have limited space for text so you want your message to be clear and concise. People usually don't have a lot of time to spend reading your website either so you want to make it as easy as possible. 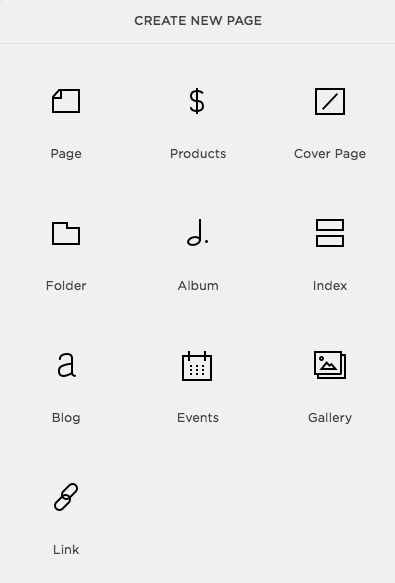 Every cover page allows you to choose to upload your logo or keep everything in text. I choose to not to use my logo because I want the header of my opt-in page to highlight the free download I'm offering. You'll see below how I used text in the "logo" section, followed by the headline, "Download 10+ FREE Stock Photos," followed by the body of the text. I use the body of the text to let people know why it's such a great idea to use the FREE stock photos. This is maybe one of the most important components of your opt-in page because this is where you collect all your emails. Here you will customize the "action" of your cover page, or what you want your customer to do. For our action we want them to sign up for our email list so you want to include the form name, which is what people will see when they click to sign up. Next, you want to edit your form. This is just a few simple clicks. Most forms start out with four fields; name, email address, subject, and message. I keep my form simple and only include name and email. I've known a few people that were hesitant to include the name field as it includes both first and last name in fear that people wouldn't sign up because they don't want to include their last name. I totally get that. But nobody actually has to include their last name or even their first name. They can put their initials, they can put their first name and their last initial, it's completely up to them. After you have built your form you want to determine where you're emails are to be stored. If you have an email service, like Mailchimp, you can sign in right within your form and designate where you want your emails to go. If you don't have MailChimp you can have your emails stored in Google Drive or sent directly to your email. This is one thing I really love about Squarespace, they make it so easy to start right where you are. If you're not ready or haven't figured out MailChimp yet you can still start growing your email list. One of the final steps within your form is the advanced section. This section takes your customer experience one step further. You can do one of two things. You can include a post-submit message thanking your new subscriber for signing up and giving them any details about their free downloads. Or you can include post-submit HTML. Post-submit HTML is ideal if you want to send your customers to another page. I use post-submit HTML to send my customers to a thank you page. This thank you page brings their experience full circle. Want to know the exact HTML I use to direct my customers to a new page? Download yours below! YES! SEND ME TO CODE! You did it! Download your HTML here and knock the socks off your customers with an amazing customer experience. Plus, as a new subscriber, you get access to 10+ FREE stock photos! Make sure to check your email and confirm your subscription! Alright friends, your final step for creating your opt-in page is the customize the style. This step is perfect for creating an opt-in page that matches your brand perfectly. Within this step you can change the colors, change the font, and adjust the placement and positioning. Want 10+ FREE stock photos straight to your inbox? Plus, fresh new photos every month? Become an Elah Tree Insider! SIGN UP BELOW!